SmartClean ChairMate High Chair - Peacock Blue is rated 5.0 out of 5 by 9. Designed with parenthood in mind.™ The Ingenuity™ SmartClean ChairMate High Chair™ has all the conveniences of full-sized high chair in a space-saving design. 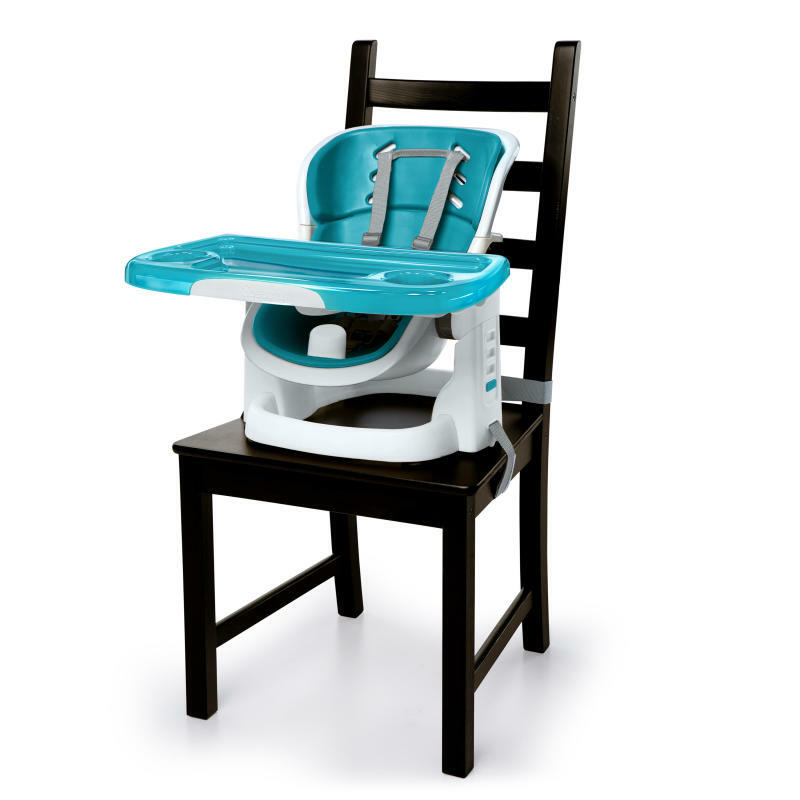 This amazing high chair saves space by attaching securely to most dining chairs with adjustable straps. The unique EVA foam seat pad means cushioning comfort for baby and the easiest clean ups for you. The EasyClean™ tray is dishwasher-safe. Even the 5-point safety straps are easy to remove and toss in the washing machine. Keep your growing baby comfortable with the seat’s two adjustable recline positions and four height positions. The adjustable and removable SmartLevel Tray™ remains level even when the seat is reclined. Baby will be able to use this chair for years since it converts easily to a booster seat during the toddler years by removing the tray. Thanks to the unique, SmartClean wipe able surface, it's never been easier to keep baby's high chair clean and ready for action. Dimension (in) 22.25" x 21.25" x 24"
Rated 5 out of 5 by Jessrenee2891 from Easy to use I have had this item for a while now and it is very convenient, functional and easy to clean! Rated 5 out of 5 by Jsh1 from Easy to use This product is very easy to set up and remove. Easy to clean up also. Rated 5 out of 5 by Justme from Perfect chair! She could use this at 3 months! I love this chair! Its perfect for everywhere. Comfortable & secure. Easy to clean, big tray, adjustable height. A must have. Rated 5 out of 5 by Bonnie from Perfect for my kitchen We have a small kitchen, so this works perfectly at our breakfast table without taking up additional floor space. Love how easy it is to clean and the double layer tray. Would definitely recommend. Rated 5 out of 5 by Krissy0414 from So cute and functional! Love the blue color it is adorable! Works great, cleans easily! Rated 5 out of 5 by Amber from Convenient and Nicely Made Perfect for traveling to grandparents house or if you don’t want a large high chair to move around. Well made and looks nice! Rated 5 out of 5 by Amber from Convenient and Nicely Made Perfect for traveling to grandparents house or if you don't want a large high chair to move around. Well made and looks nice! Rated 5 out of 5 by Grandma3 from Great product for apartment living This little high chair is anything but little. My granddaughter is 6 months and on the smaller side. She fits perfectly in it and will use for a long time to come! Love how you can remove pieces for easy clean up. No longer do you need a big high chair that takes up so much space. Very easy to remove from any chair to take with you to relatives homes. Highly recommend this one.